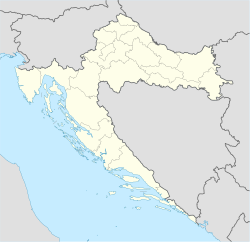 Sisak (pronounced [sǐːsak]) is a ceety in central Croatie locatit at the confluence o the Kupa, Sava, an Odra rivers, 57 km (35 mi) sootheast o the Croatian caipital Zagreb. ↑ "Enumerated persons, households and housing units, 2011 census". Census of Population, Households and Dwellings 2011. Zagreb: Croatian Bureau of Statistics. December 2012. Retrieved 2013-06-17. ↑ "Twin Towns". gabrovo.bg. Retrieved 27 April 2014.